Gray dogwood (stiff dogwood), Cornus foemina. Gray dogwood is a shrub with stiff, upright, irregular branches and is often thicket-forming; it is sometimes a small tree. Leaves are opposite, simple, lacking teeth or lobes, lance-shaped or broadest at the middle, 2–4 inches long, tapering to a broadly pointed tip. The lower leaf surface is paler than the top. Bark is gray, smooth when young, developing shallow grooves with age. Twigs are reddish or greenish when young, becoming gray or gray-brown with age. Flowers May–July, small, creamy-white flowers in round-topped, open, branching clusters 1¼–2½ inches broad. Fruits July–October, white or pale blue, round, fleshy, ¼ inch in diameter; one-seeded. Fruits borne on red stalks. Stiff dogwood (ssp. foemina) has leaves whose undersides are lighter green than the uppersides, but not appearning pale or whitish; the young twigs are reddish brown, the bark rather smooth; flower clusters fairly flat-topped; and fruits light blue or blue-and-white mottled. It lives mainly only in Bootheel swamps and nearby southeastern Ozarks. The bright blue fruits and brown branches are quite attractive. Gray dogwood (ssp. racemosa) has leaves whose undersides are pale or whitish; the young twigs are brown, tan, or sometimes pinkish, the bark usually with small, slightly raised, lighter dots; flower clusters half-spherical or pyramidal (not flat-topped); and fruits white. It has a broader, more northerly distribution in our state. The white fruits and the reddish stalks and flower branches, plus purple, yellow, pink, and green fall color, make it attractive. 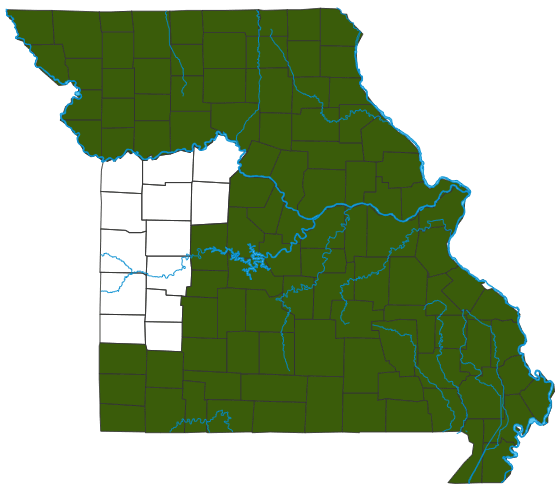 Similar species: There are 4 other species in the genus Cornus in Missouri. Height: to 15 feet; spread: 10 feet. Swamps, bottomland forests, moist upland forests in ravines, banks of streams and rivers, margins of ponds and lakes, bases of bluffs, fens, acid seeps, and edges of bottomland and upland prairies; also fencerows, old fields, ditches, railroads, and roadsides. Scattered nearly throughout the state but absent from most of the Unglaciated Plains Division. Of the two subspecies, gray dogwood is the one with the more widespread distribution in our state, while stiff dogwood occurs only in the southeast. Both are attractive and may be cultivated anywhere in the state. This small dogwood has considerable value in landscaping. The white or bluish fruits are attractive on their reddish stalks; in fall, the leaves turn purple with highlights of yellow, pink, and green; and flowers are often produced even when the trees are still young. Like many other shrubs and small trees, this plant provides cover for songbirds and other wildlife. The fruits are food for many species. Birds, for instance, eat the fruits, then disperse the seeds in their droppings.